If you’re looking to run an email marketing campaign for your company, it helps to know the ins and outs of email design. It might not seem like the most important aspect of email marketing to focus on, but email design is of crucial importance if you want people to care about your emails. 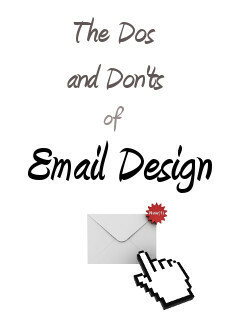 Without a well-crafted and clear design for your emails, they run the risk of being sent to the trash. With many companies using email marketing to drive in more business, it helps to make sure you’re doing everything you can to stand out. If you’re not careful, simple email design mistakes can ruin your campaign and waste your money. Luckily, following these easy email design dos and don’ts will get you on the right track, and help you build a successful campaign. If your emails contain too much text or too many images, there’s a chance they won’t make it through the spam filters. Also, keep in mind that many email clients will block images initially, so readers might not know what your email is about. Correctly integrating text with images ensures that your message will be more visually appealing for your recipients. A good rule of thumb to keep in mind is 60% text, 40% image. Since some email apps and clients might not support your HTML email design, always provide a plain text version. It always helps to double check that the content in your plain text version matches your HTML version. You want to make sure your message comes across to all your recipients. Many recipients will be opening emails on their mobile devices, so you need to make sure your emails are designed for it. Designing an email creative with responsive design is important for making sure your emails look great no matter what device your readers are using. Keep images/image size in mind and always check how it will look on a mobile device before you send it. Make sure your content is mobile friendly! One of the most important things you need to do as an email marketer is ensure that your emails are following the CAN-SPAM laws. Read up on these laws before you send out any emails. It helps to have in-depth knowledge of these laws in order to avoid any unnecessary penalties and fines. Your recipients will want to know the point of your email and they will want it presented to them quickly. They don’t want to sift through your emails in order to figure out why you sent it. Your call to action, whether it is a link to your offer or a downloadable coupon, needs to be located prominently. Keep your call to action near the top of your message to ensure it is seen right away. Embedding a video into the design of your email is never a good idea. Attaching a video or other large files will almost definitely send your email to the spam folder, and most people just don’t have the patience for them. If you really need to include a video, try linking to it instead. If you’re sending out business emails, you need to remain professional. If an email is riddled with grammar mistakes, most people won’t take your message seriously. Proofread the content of your email design several times before you send out your emails. A visually boring email design probably won’t get much engagement, so you need to make sure you put a lot of thought into it. You shouldn’t just list loads of information that your recipients probably won’t read. Get creative and think of ways to entice recipients to act on your offers. If you want to get your message across to your email recipients, don’t take email design lightly. A well-crafted email will not only avoid the trash and spam filters, but people will also be more likely to interact and engage them. Taking the extra time to plan out your next email campaign can make a huge difference.